Edifier Aurora MP300PLUS Speaker System | Product overview | What Hi-Fi? Overview The award-winning Aurora 2.1 speaker system is engineered to impress. Compact, lightweight, but incredibly functional. And with 5 eye-popping colours to choose from, amazing sound has never looked so good. Award-Winning Design Recognised for its stylish yet functional design, Aurora is the winner of the prestigious Red Dot Design Award. 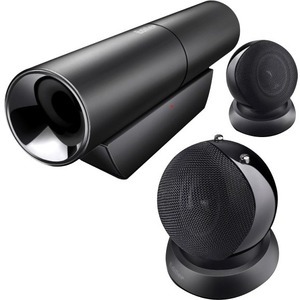 The 2.1 speaker system features a 2" tubular subwoofer and 2 spherical satellites with metal weave grills. No matter where you choose to place Aurora, it's going to look gorgeous and sound amazing. Colourful Music A complete music experience is one that stimulates all your senses. Aurora makes music look as good as it sounds, thanks to an impressive selection of eye-popping colours. You're bound to find a colour that reflects your personality and complements your space, at home or in the office. Convenient Control Control your music at your fingertips, with 2 volume control buttons conveniently located on top of the satellite. Superior sound Excelling not only in exterior design, Aurora is also well-made inside, producing impressive sound quality with a well-controlled base from the subwoofer and mid-tones that are pleasingly clear, with good, tonal balance. Aurora is equipped with the Edifier Intelligent Distortion Control (EIDC), engineered to clarify stereo sound and eliminates distortion.The patented technology uses a single microprocessor to collect and calculate the distortion level of the output signal. It automatically adjusts the amplifier to protect the system from output overload, allowing for different input sources with varying input levels. Sound is clear, detailed and without any strain or distortion.